Trinity College Dublin is the top ranked university in Ireland. Using the QS methodology we are ranked 104th in the world and using the Times Higher Education World University Rankings methodology we are 117th in the world. 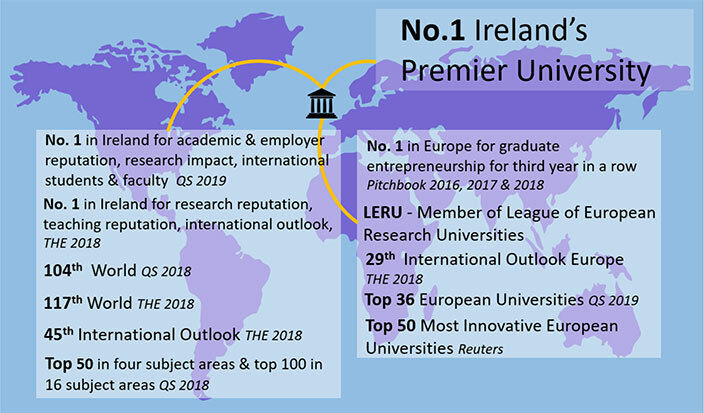 Trinity is ranked 27th in the World in terms of International Outlook and is the highest ranked university in Ireland. Trinity is ranked 13th in Classics and Ancient History. Trinity is ranked 28th in English Language and Literature. Trinity is ranked 39th in Mineral and Mining Engineering. Trinity is ranked 41st in Nursing. Trinity has three faculties - Arts, Humanities and Social Sciences; Engineering, Mathematics and Science; and Health Sciences. Students can avail of over 170 societies and sports clubs.